This I Am Glad. . . 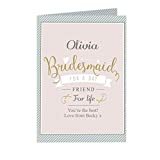 Bridesmaid Card is a great way to say ‘thank you’ to a special bridesmaid for their role on your wedding day. The card can be personalised with a name up to 12 characters long and a message over 2 lines with up to 20 characters per line on the front. The inside of the card can be personalised with a message over 5 lines with up to 20 characters per line. Please note that all text is case sensitive and will appear as entered. The text ‘Bridesmaid for a day’ and ‘Friend for life’ is fixed and cannot be amended. These cards come in a brown outer envelope with a Plain White envelope inside and measure 185mm x 132mm.